Unlike the equity exchanges, the Foreign Exchange market is open for trading on a 24 hour basis throughout the week. Brokers normally close operations late on Friday, GMT time, and open again for trading late in the evening on Sunday GMT time, when the first Asian session of the week begins. On Mondays, at around 8:00 AM, London traders get to their desks and buying and selling of currency pairs gets going again in earnest for the week. Apart from the close late on Friday to the open the following Sunday evening (GMT), the Forex market looks to be continuous, and it normally is. But there are certain occasions when, for technical reasons, trading takes on a special significance. One such is known as the fixing time. There are a number of these throughout the global day, most notably in Tokyo, in the Chicago futures market, and in the most important Forex market, the one in London. Fixing time in London is at precisely 4:00PM, or 16:00 hours (at the time of writing this, even though we are referencing London where Greenwich is situated, we cannot say that this is Greenwich Mean Time (GMT), because London is on GMT + 1 hour in order to facilitate daylight saving arrangements). The fix is when commercial buyers of currencies can carry out their transactions at a time that would correspond to the closing price for the day if it were equities that were being traded. The daily mark-to-market requirements of such funds that carry Forex positions are also taken care of by reference to the exchange rate at this time. Although the London fix is normally completely transparent as far as non-institutional Forex traders are concerned, there were two consecutive days recently when the fix became very noticeable indeed. These days were Thursday 10th and Friday 11th of this month, September 2015. The chart at the top shows the first day, and the one directly above the following one. 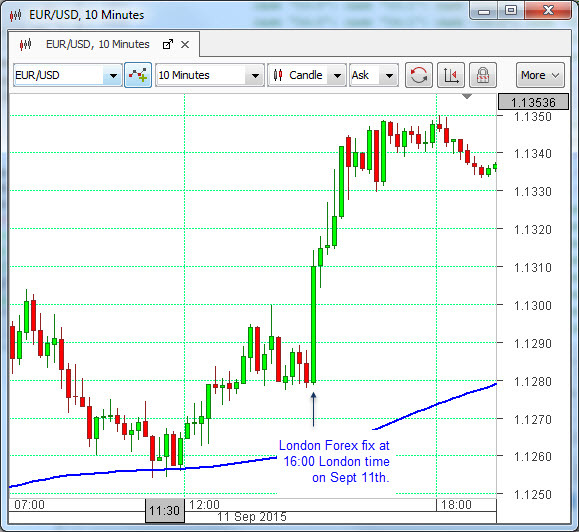 In each case the Euro started to strengthen appreciably against the dollar at the precise moment of the London fix. On the Friday, there had been an economic report, the Reuters / University of Michigan Consumer Sentiment Index, one hour earlier, which has been known to move the market in those currency pairs that involve the US dollar, and one could have been forgiven for thinking that the move seen on the chart was a delayed reaction to this. But it was not. On both days it appears that there was a decided imbalance in EURUSD orders that were placed to coincide with the London fix. 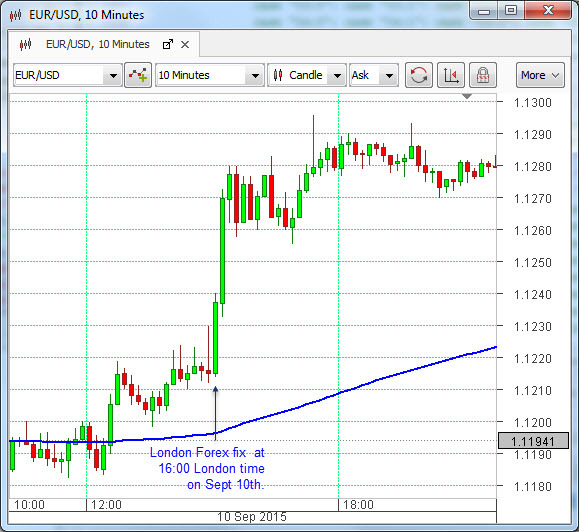 In each case this caused the EURUSD pair to rise in a dramatic manner. Does this happen often? In a word, no. Using the historical analysis capabilities of the OmiCronFX Mandelbrot routine, we were able to ascertain that the price action on the two days in question was unique in the mid-to-recent past.